ABOVE: A motoscafo or waterbus of the ACTV. Catch the 4.1 or 4.2 waterbus. The 4.1 will get you to the Murano Colonna stop in 10 minutes; the Faro, Navagero, and Museo stops take longer. Alternatively, you could take one of the boats on Line 12 or 13, which require only nine minutes to reach the Murano Faro stop on their way to more distant points in the northern section of the Venetian Lagoon. Ride the Line 3 "Diretto Murano" boat, which takes 17 minutes to reach Murano Colonna from the railroad station. Stay on the boat if you'd rather get off at Faro, Navagero, Museo, or Venier. The 4.1 waterbus, which is slower than the 3 with local stops along the way. For more information on ACTV waterbuses, see our articles on Vaporetto Routes and Vaporetto Fares, or use the station-to-station journey planner on the Actv Web site. Alilaguna's airport water buses serve various stops on Murano; see our Venice Airport Boat article for more information. If you're in a hurry and have money to burn, a water taxi can take you directly to Murano from your hotel (or the nearest canal). 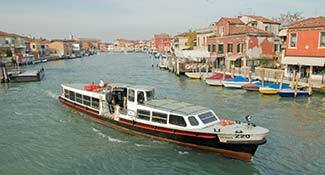 Our sightseeing-excursion partner, Viator, sells escorted tours to Murano and the Lagoon's outer islands.